Facebook Home is coming to Google Play around the world later today, which means that anyone with a compatible handset will be able to download and install the Facebook-flavoured Android overlay. to be able to make use of the free download. If that sounds like you, you can enjoy Facebook's not-quite-an-OS which puts the social network front-and-centre on your handset. The app-but-not-an-app went live in the US on April 12. 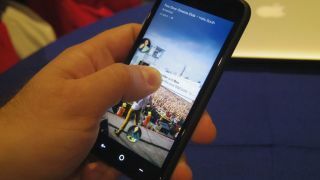 The software turns your phone into a Facebook machine, putting Cover Feed on the homescreen with scrolling photos and status updates to enjoy without even unlocking your phone. Messaging is taken care of by the floaty-bouncy Chat Heads which pop up and glimmer at you when you have a chat running, until you flick them off screen. Although it takes over your phone entirely, you can still get at your non-Facebook apps thanks to Facebook Home's app launcher. If you don't have a compatible Android phone, never fear - you can still get annoyed with those persistent Chat Heads as they are now available in Messenger for Android. And now you can even get them on your iPhone too. Chat Heads. Inescapable.